Falls can wreak havoc on the spine and body as a whole. Don’t hesitate to seek emergency medical attention if you hit your head or you are in a lot of pain. See your chiropractor as soon as possible to asses the situation. Misalignment as a result of the fall can mean your spine overcompensates and other painful issues might manifest. Know that even with bruising and pain and nothing broken, it’s ideal to see your chiropractor as soon as possible so he or she can take your current state into consideration when continuing your course of care. A fall can mean you need to adjust your lifestyle even after taking a few days or weeks off to recover. For example, you may need to forgo your gym routine until the stiffness, inflammation and pain are at bay. Even when you’re back at it, you may need to limit the time of your workout and/or go easy on the strength training. The point here is that too many people return to their routine and do too much too soon—a recipe for disaster. In short, it’s always a good idea to ease back into movement. A fall can be a shock to the system, but you can take action while you’re waiting to see your chiropractor. In the days after the fall, it’s recommended to use ice on the injured area for 10-15 minutes and then leave it off for 45-60 minutes to keep swelling under control. Repeat as often as desired. You might also look to dietary changes for an added boost. Natural anti-inflammatories include garlic, turmeric, and bromelain (found in pineapple juice). In other words, listen to your body and seek out a professional opinion if you suspect something is out of sorts. 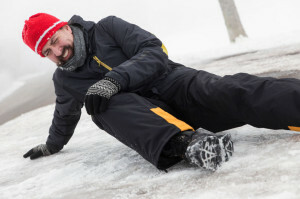 Your chiropractor can help you get back on your feet after a slip or fall.